In 2016, the majority of women's soccer teams in Latin America were designated "inactive" by FIFA. Women players launched protests, still ongoing, for better conditions in the sport. Historian Brenda Elsey of Hofstra University will explore the implications of these protests in this year's Harold Seymour Lecture in Sports History. 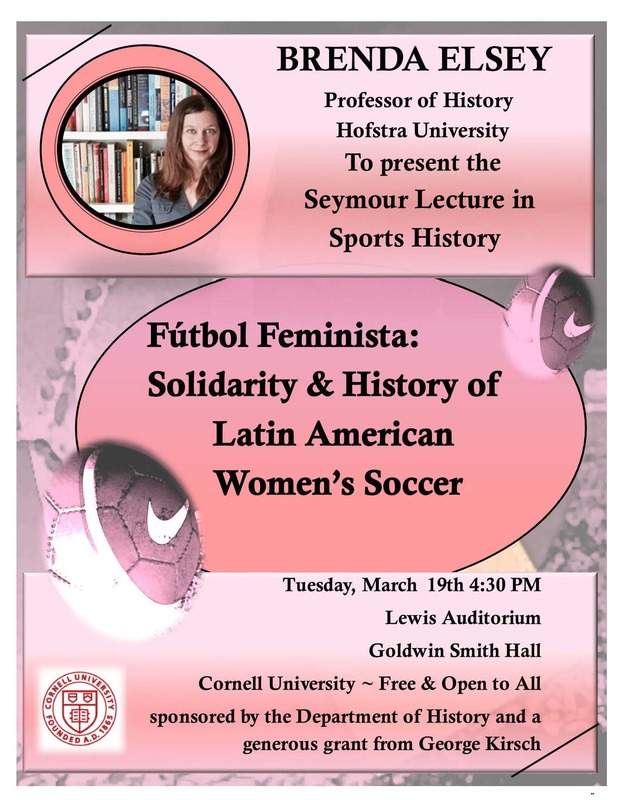 The talk, “Fútbol Feminista: Solidarity and History of Latin American Women's Soccer,” is scheduled for March 19, 2019, at 4:30 pm in Lewis Auditorium, Goldwin Smith Hall on the Cornell University campus. In her talk, Elsey will offer historical context and discuss how the protests can help us understand new feminist movements, women's experience as athletes, and the global landscape of professional sport. “Brenda Elsey is a pioneering and prolific historian of popular culture, politics, and sport in Latin America. Her work on the feminist sports podcast, ‘Burn It All Down,’ shows that she is also a committed public historian. She thinks as creatively about the history of politics and sports as any intellectual that I know,” says Lawrence Glickman, the Stephen and Evalyn Milman Professor in American Studies. Elsey is associate professor of history at Hofstra University, specializing in gender, politics, and popular culture in Latin America. She is the author of Citizens and Sportsmen: Fútbol and Politics in Twentieth-Century Chile and co-author with Joshua Nadel of Futbolera: A History of Women's Sport in Latin America. She has also written for mainstream outlets such as The Guardian, New Republic, and Sports Illustrated. She is the co-host of the weekly sport and feminism podcast, Burn It All Down. The Harold Seymour Lecture in Sports History is presented annually by the Department of History with the generous support of George Kirsch ’67 and brings distinguished sport historians to Cornell. Seymour was the first baseball historian, known for his three-volume book detailing the development of the sport from an amateur pastime into a professional sport.